Many heroes are born, arrive on the scene, make their mark upon the world and then die either in a blaze of glory or on their deathbed. Either way, their like is never seen again. That is not soon for the centuries-old protector of the Bandar tribe in the Bengali jungles of Southeast Asia. Many times he's gone down in defeat, and his foes have believed him dead and gone. In a world where many still hold to the supernatural, many truly believe that The Phantom is an undying avenger of wrongs. 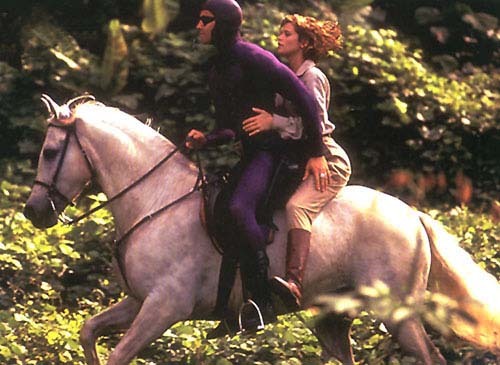 The truth is far less exotic, but no less fantastic; The Phantom is the product of a centuries-long family tradition of heroism and protection of the innocent. Each from the 16th century to the most recent one in 2056, swears the Code of the Phantom upon the same skull and does his utmost to live by its precepts. Each has Skull Cave as his headquarters. Each wears the same rings, which are used to mark friend and foe alike, and each focuses upon the same nefarious enemy: the Sengh Brotherhood, an organization of pirates and slavers that (in the contemporary and future junctures) expanded world-wide into terrorism and contraband trafficking. The Phantom's true name is Kit Walker. By tradition the first Walker son is given this name, and as such becomes heir to the heroic mantle, taking up the cause and continuing on when his father, the Phantom before him, passes away. A young Kit Walker spends the years of his youth split between his father's home in the jungle and his mother's home in the Western world. He receives the best education possible, is both an athlete and a scholar, and often comes from the upper-crust of Western society. What he cannot learn from his Western schooling, he learns as the knee of his father in the jungle. The rest, usually, comes in the form of the *many* volumes of knowledge recorded by his forebears in books of the library maintained in Skull Cave. Of course, no man is an island and a true hero always has someone in his corner to help him and the Walker's are no different. Traditionally, the chieftain of the Bandar tribe is also The Phantom's primary aide. He is one of the very few people who know the truth about The Ghost Who Walks. As with his Western ally, the chieftain's son is also groomed to take his place. Should the current Phantom die before the chieftain is ready to abdicate, his son becomes his aide. (This was the case with the 20th and 21st Phantoms in the early 20th century.) WIth the beginning of the British Empire's expansion into Asia, another ally came in the commander of the local army garrisson- the leader of The Phantom's "Ghost Patrol", a group of like-minded folk who report to the patrol's leader. (The leader is the only one who ever seen The Phantom.) Finally, the most reliable allies any Phantom has is his wife (traditionally a Western woman met in his youth) and his children (especially his heir). "I am The Ghost Who Walks." Juncture: 1850 (Phantom XIX), 1999 (Phantom XXIII), 2056 (Phantom XXVI) In all cases, these stats represent each Phantom within a couple years of assuming his father's place. Bod 7, Chi 0 (For 2, Fu 1), Mind 7, Ref 7. Detective: 15, Guns: 13, Fix-It: 9, Info/Science: 9, Info/Sengh Brotherhood: 10, Info/Bengali Jungle: 10, Intimidation: 12, Martial Arts: 12, Driving: 8, Intrusion: 8. Expert on the Criminal Mind (Type's Unique Schtick), Derring-Do, Hair-Trigger Neck Hairs x1, Lightning Reload x1. Weapons: Colt .45 cal. M1911 automatic pistols x2, skull ring, wheel ring. The 1850 Phantom has no weapons as standard. He uses whatever weapons he finds and discards them when no longer neccessary. The 2056 Phantom has Info/Sengh Brotherhood at AV 9 and adds Info/Buro at AV 8. He carries a pair of Buro 9As instead of the Colts. All three Phantoms are (or recently became) inner-walkers, which *will* play merry hell with the entire Secret War because (since the familial resemblence between generations is a strong one), yes, they all look a lot alike. GMs get the benefits of a mistaken identity subplot with none of the overly-hokey "evil twin" or "unknown clone" premises. This also means that they can (and will) team up to fight common foes and save each other's bacon.) A quick-thinking faction leader, especially one with similar beliefs, will move fast to recruit these guys and, without a doubt, each one will join the Dragons. To the Dragons, this is a *great* coup. They get three members for the price of one, each with stable power bases they can base themselves from. (Skull Cave is a feng shui site. See below.) It seems too good to be true, and that's because it is. Unfortunately, there's not much that can be done about it unless the GM is merciful and/or the PCs are truly crafy bastards. To attune to this site one must befriend the current Phantom. Those attuned to any Skull Cave recieves the usual benefits. In addition, they also gain one other benefit: they may add one additional positive to any *one* roll, once per session, and this may be cumulative with a spent Fortune die. Additional Skull Cave attunements do not grant additional dice. Instead, they grant more experience points: 8 pts. for two, and 12 pts. for three. Now you know why those Phantoms are so hard to kill. Should your PCs be so bold & lucky as to burn this site, they get 7 pts. instead of the usual 5 XP. The other factions haven't a clue about what to do about these costumed do- gooders. The Hand occasionally allies with them, as do the Jammers. The Four Monarchs ignore him, and the independants' opinions vary greatly. (Death Shadow occasionally thinks about courting the 1999 Phantom.) Most of the time, they assume it's all some Dragon plot and act accordingly.